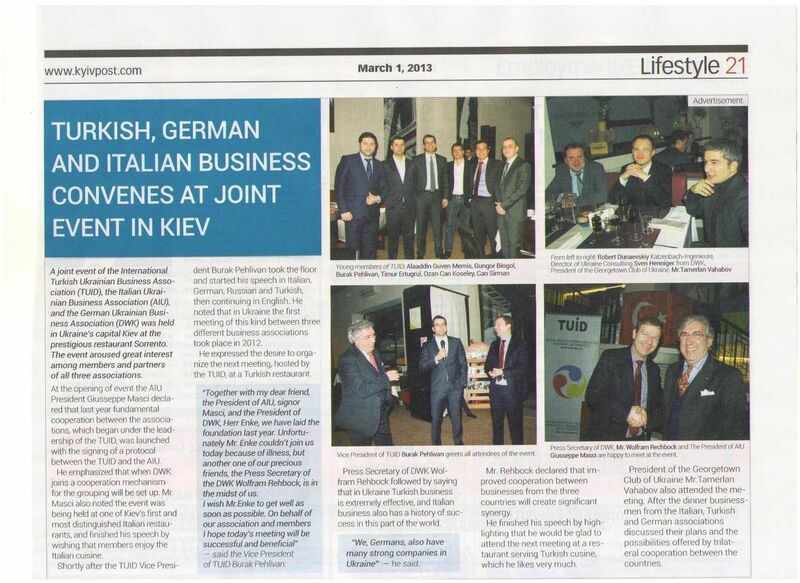 Turkish, German and Italian Businessmen’s joint meeting which was taken place in Sorento Restaurant which is one of the most prestigious Italian restaurants in Kiev was published in English speaking media of Ukraine. Kyiv Post which has been distributed 40 thousands of copies every week and What’s On magazine mentioned very widely about this dinner which had gathered more than 80 businessmen from Turkish (TUID), German (DWK) and Italian (AIU) associations. A joint event of the International Turkish Ukrainian Business Association (TUİD), the Italian Ukrainian Business Association (AIU), and the German Ukrainian Business Association (DWK) was held in Ukraine’s capital Kiev at the prestigious restaurant Sorrento. The event aroused great interest among members and partners of all three associations. At the opening of event the AIU President Giusseppe Masci declared that last year fundamental cooperation between the associations, which began under the leadership of TUID, was launched with the signing of a protocol between the TUID and AIU. He emphasized that when DWK joins a cooperation mechanism for the grouping will be set up. Mr.Masci also noted the event was being held at one of Kiev’s first and most distinguished Italian restaurants, and finished his speech by wishing that members enjoy the Italian cuisine. Shortly after the TUID Vice President Burak Pehlivan took the floor and started his speech in Italian, German, Russian and Turkish, then continuing in English. He noted that in Ukraine the first meeting of this kind between three different business associations took place in 2012. He expressed the desire to organize the next meeting, hosted by the TUID, at a Turkish restaurant. «Together with my dear friend, the President of AIU, signor Masci, and the President of DWK, Herr Enke, we have laid the foundation last year. Unfortunately Mr.Enke couldn’t join us today because of illness, but another one of our precious friends, Press Secretary of the DWK Wolfram Rechbock, is in the midst of us. I wish Mr.Enke to get well as soon as possible. On behalf of our association and members I hope today’s meeting will be successful and beneficial» – said the Vice President of TUID Burak Pehlivan . Press Secretary of DWK Wolfram Rechbock followed by saying that in Ukraine Turkish business is extremely effective, and Italian business also has a history of success in this part of the world. «We, Germans, also have many strong companies in Ukraine» – he said. Mr. Rechbock declared that improved cooperation between businesses from the three countries will create significant synergy. He finished his speech by highlighting that he would be glad to attend the next meeting at a restaurant serving Turkish cousine, which he likes very much. The President of Georgetown Club of Ukraine Mr. Tamerlan Vahabov also attended the meeting. After the dinner , businessmen from the Italian,Turkish and German associations discussed their plans and the possibilities offered by trilateral cooperation between the countries. 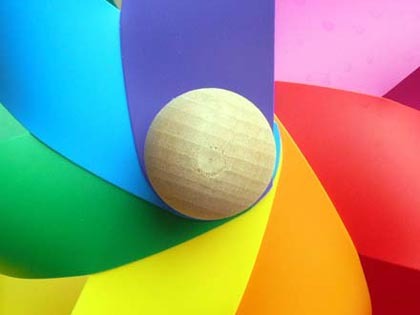 Next post: İtalya’da Var, Bizde Niye Yok?